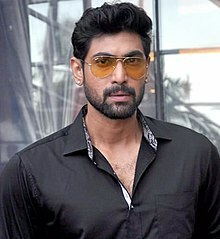 Rana Daggubati (born 14 December 1984), is an Indian actor, producer, television personality, and visual effects co-ordinator known primarily for his work in Telugu cinema, as well as his works in Tamil cinema and Hindi cinema. In 2010, he made his acting debut with the Telugu blockbuster Leader, for which he won the Filmfare Award for Best Male Debut – South. He made his Hindi film debut with the hit film Dum Maaro Dum (2011), alongside Bipasha Basu, where he received positive reviews for his performance. In 2012, Rana gained prominence by starring in hit Telugu film Krishnam Vande Jagadgurum. In 2015, he played a notable supporting role in the successful Hindi film Baby (2015). He later starred as the main antagonist in Telugu and Tamil bilingual Baahubali: The Beginning (2015), which recorded the second highest gross opening for an Indian film. He then featured in a supporting role in Tamil film Bangalore Naatkal (2016). In 2017, Rana later reprised his role as Bhallaldeva in Baahubali 2: The Conclusion, which became the highest grossing Indian film of all time. He has also simultaneously starred in the successful Telugu movies Rudramadevi (2015), The Ghazi Attack (2017), and Nene Raju Nene Mantri (2017). As a Visual Effects producer, Rana won the State Nandi Award for Best Special Effects in 2006 for the Telugu film Sainikudu. In 2006, he received the National Film Award for co-producing Bommalata – A Bellyful of Dreams. Rana is also an established television personality, as he hosted award shows such as the 2nd IIFA Utsavam, the 2nd South Indian International Movie Awards and he currently hosts his own celebrity talk show, No. 1 Yaari, which brought celebrities such as Vijay Deverakonda, S.S. Rajamouli, Nani, Kajal Aggarwal, Naga Chaitanya, Tamannaah, Rakul Preet Singh, Ram Pothineni, Navdeep, Nikhil Siddharth, and others. Rana has established himself as one of the leading actors in Telugu cinema, as well as being described as one of the few actors in India who were able to achieve pan-Indian appeal, having taken up a variety of roles, from leading roles to supporting characters, in different languages as well. Rana was born in Chennai, Tamil Nadu, to Telugu film producer Daggubati Suresh Babu and is part of the Daggubati-Akkineni Family. His paternal grandfather was Tollywood film producer D. Ramanaidu. His paternal uncle Venkatesh and his cousin Naga Chaitanya are also actors in the film industry. Rana revealed in 2016 that he is blind in his right eye, and his left eye is a transplanted one. The surgery was done in L. V. Prasad Hospital, Hyderabad. Another surgery was done on his right eye when he was 14, but was unsuccessful. He did his schooling in Hyderabad and Chennai from Hyderabad Public School and Chettinad Vidyashram. He lives with his family at his home in Hyderabad. Rana's first movie was Leader, in Telugu, directed by Shekhar Kammula, which is one of his biggest successes. Rana made his Bollywood debut with the film Dum Maaro Dum, which released on 22 April 2011. The Times of India called it a "dashing debut". He was voted "The Most Promising Newcomer of 2011" in the Times Of India poll. He was listed at number 20 on the Times of India's Most Desirable Men for the year 2011. In 2012, he was voted as the 10th most desirable man in India, in the poll conducted by The Times of India. He played a professional killer in the film Nenu Naa Rakshasi, under Puri Jagannath's direction, which was a box office bomb. His first release in 2012 was Naa Ishtam, which was followed by his second Hindi film Department. He next starred in Krishnam Vande Jagadgurum, directed by Krish, which became a box office success. He made his debut in Tamil through Thala Ajith Kumar's Aarambam. Rana did a cameo role in Ayan Mukerji's Yeh Jawaani Hai Deewani. In 2013, he joined two big budget projects, Gunasekhar's Rudhramadevi and S. S. Rajamouli's Baahubali, in which he is the lead antagonist. Rana played Bhallaladeva, the cousin of Baahubali, who had negative shades and received unprecedented appreciation from critics. Baahubali: The Beginning was released worldwide in July 2015 and was the highest-grossing film in India at the time of its release. The concluding film of the series Baahubali 2: The Conclusion, became the first Indian film to cross 1000 crore and is currently the second highest grossing Indian film. In 2017, he did India's first underwater film, The Ghazi Attack. It opened to very positive reviews. After Baahubali 2's epic release, he further did a Telugu political Thriller movie Nene Raju Nene Mantri in which he plays a Politician with grey shades, alongside Kajal Aggarwal. This film too received positive reviews for Rana's acting and screen presence. The film, also called NRNM, was also released in Tamil as Naan Aanaiyittal and in Malayalam as Raja Kireedam. It was also dubbed into Hindi as Main Hi Raja Main Hi Mantri. Along with the movies, he also starred in a web series called Social. Further, he hosted a Telugu Television programme, No 1. Yaari, which created highest TVP values for a Telugu TV show. He also dubbed for the character Thanos in the Telugu dubbed version of Avengers: Infinity War. ^ a b "What Caused Bhallaladeva, Aka Rana Daggubati, To Go Blind In One Eye?". Outlook India. Retrieved 28 May 2017. ^ "Happy Birthday Rana Daggubati: From Leader to Baahubali, Rana's blockbuster journey". The Indian Express. 14 December 2016. ^ Rajamani, Radhika (24 November 2009). "An entrepreneur who acts too". Rediff. Retrieved 24 October 2010. ^ Vamsi, Krishna. (16 December 2016) Baahubali 2: Rana Daggubati’s first look as Bhallaladeva is out and he looks vicious, see pic. The Indian Express. Retrieved on 2018-08-12. ^ "Photos: Nene Raju Nene Mantri actor Rana Daggubati impresses audience as a storyteller at TedxHyderabad". ^ "From 'Baahubali' to 'Ghazi', Rana Daggubati has come a long way – Times of India". Retrieved 1 May 2017. ^ "Content is king for Rana Daggubati as Ghazi, Baahubali 2 win National Awards". ^ Mike McCahill. "Baahubali: The Beginning review – fantastic bang for your buck in most expensive Indian movie ever made". The Guardian. ^ Sangeetha Devi Dundoo (10 July 2015). "Baahubali review: A little more, a little less". The Hindu. ^ Nanisetti, Serish (12 July 2015). "Baahubali Smashes Box Office Records, Rakes in Rs 68 Crore". The New Indian Express. ^ The multifaceted ‘leader'. The Hindu (12 February 2012). Retrieved 23 April 2016. ^ "53rd National Film Awards" (PDF). Directorate of Film Festivals. pp. 93–94. Retrieved 19 March 2012. ^ "The new entrants in Times 50 Most Desirable Men 2011". The Times of India. 4 February 2012. ^ "Rana Daggubati's a family man". The Times of India. 19 June 2011. ^ Baahubali 2: The Conclusion actor Rana Daggubati makes stunning revelation, says he is blind in one eye. The Financial Express (30 April 2017). Retrieved on 2018-08-12. ^ ராணா பார்வை இழந்தார் | Rana Was Blind, But How He Got His Vision? – YouTube. M.youtube.com (27 April 2016). Retrieved on 2018-08-12. ^ Actor Rana daggubati at Maxivision Super Speciality Eye Hospital – YouTube. M.youtube.com (15 April 2013). Retrieved on 2018-08-12. ^ Bahubali – Bhallala Deva Rana Inaugurated Dr.Agarwal Eye Hospital- Hybiz.tv – YouTube. M.youtube.com (24 June 2015). Retrieved on 2018-08-12. ^ Twitter. Mobile.twitter.com (17 April 2017). Retrieved on 2018-08-12. ^ "Dum Maaro Dum-Gripping thriller". The Times of India. 21 April 2011. Retrieved 18 May 2012. ^ "The Most Promising Newcomer of 2011 – Male". The Times of India. 26 March 2012. Retrieved 5 May 2013. ^ "Times Most Desirable Men of 2011: Rana Daggubati – No. 20 – Video". The Times of India. ^ "Bipasha is like family: Rana Daggubati". The Times of India. 16 December 2011. ^ "Rana Daggubati turns professional killer". Rediff. 27 April 2011. Retrieved 5 May 2013. ^ "Allu Arjun rejects Ileana ". IndiaGlitz. 21 June 2011. Retrieved 5 May 2013. ^ "'Leader' to 'Krishnam Vande Jagadgurum': Why hasn't Rana Daggubati found a foothold yet?|South Cinema Photos". CNN IBN. 27 November 2012. Retrieved 5 May 2013. ^ "Krishnam Vande Jagadgurum heads towards Rs 45-cr collections". Business Standard. 3 December 2012. Retrieved 5 May 2013. ^ : Shekhar (3 December 2012). "Krishnam Vande Jagadgurum strikes gold at Box Office ". OneIndia. Retrieved 5 May 2013. ^ "Rana's cameo in Yeh Jawani Hai Deewani | Hindi Movies News". BollywoodHungama.com. 21 May 2012. Retrieved 5 May 2013. ^ "Rana as Chalukya in Anushka's Rudrama Devi". The Times of India. 11 February 2013. Retrieved 5 May 2013. ^ "Director Rajamouli in location hunt for Bahubali". The Times of India. 11 February 2013. Retrieved 5 May 2013. Wikimedia Commons has media related to Rana Daggubati. This page was last edited on 19 April 2019, at 03:31 (UTC).